Breastfeeding moms in the South, get ready to bust out! 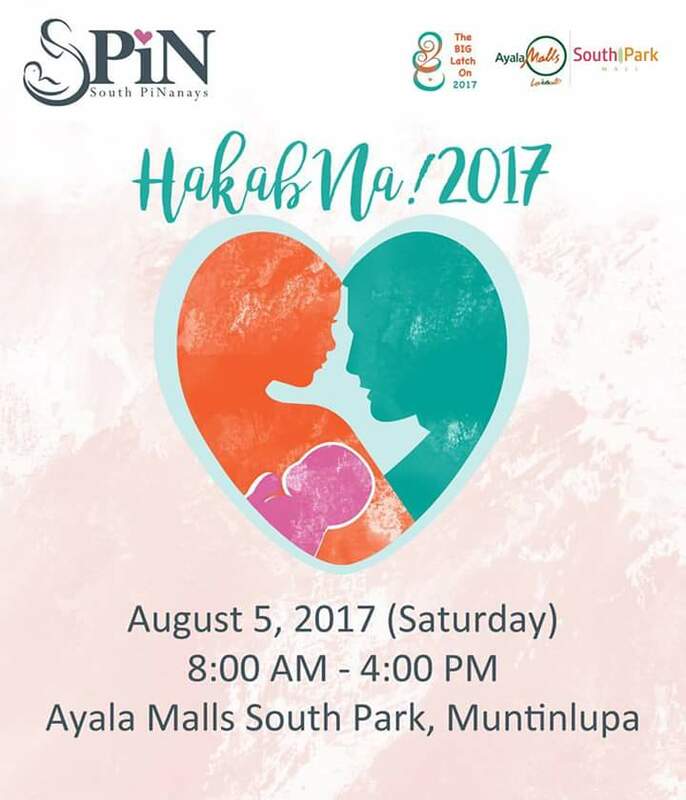 Join the South PiNanays as we break down the barriers to sustainable breastfeeding, at Hakab Na! 2017, on August 5 (Saturday), at the Ayala Malls South Park in Muntinlupa City, from 8:30 a.m. to 4:00 p.m.
Hakab Na! is the Philippines’ contribution to the Global Big Latch On, an international celebration of breastfeeding, held in line with World Breastfeeding Week (August 1-7). With this year’s global theme of “Sustaining Breastfeeding Together,” the goal for advocates worldwide is to forge multi-sectoral partnerships to help women sustain successful breastfeeding. Why sustain breastfeeding? Science tells us that breastfeeding benefits not only babies, but also women, society, the economy, and the environment. Successful breastfeeding is not just a victory for the breastfeeding mother and child, but for sustainable development as well. This is South PiNanays’ third year at hosting Hakab Na! for families living south of Metro Manila. More than 200 mom and baby pairs are expected to join this year’s celebration. On the program: expert talks on breastfeeding and parenting, testimonials on overcoming breastfeeding challenges, a mompreneur fair, and the main event– a simultaneous latch- on at 10:30 a.m. Games and other fun activities await participants.